The Great Thirteenth Dalai Lama. Prophet of the Tibetan Apocalypse. Last Tuesday marked the 50th anniversary of a Tibetan monk uprising that in 1959 punctuated nine years of brutal Chinese occupation of Tibet starting in 1950. It resulted in the daring escape of the current and fourteenth Dalai Lama, Tenzin Gyatso, across the Himalayan mountains into India where he established his rule of Tibet in exile at Dharamsala ever since. “These 50 years have brought untold suffering to the land and people of Tibet,” said the country’s 73-year-old “Messiah” in a speech delivered to around 2,000 Tibetan exiles and sympathizers gathered Tuesday to commemorate the rebellion. One might take umbrage at my calling the Dalai Lama a messianic figure but to those of you who understand what the term “messiah” in essence means, he is the closest thing to it, chanting and governing the Tibetan people. He is equally the political ruler “and” spiritual father of his people. Tibetan Buddhism got its start in the 8th century when the Indian-Buddhist mystic Padmasambhava created a synthesis of home grown Tibetan shamanism with the monastic teachings of Gautama Buddha (563?-483? B.C.E.) to create Tibetan Lamaism. The hybrid Buddhist sect has since been steeped in meditation and shamanistic prophecy. The concept of a spiritual-temporal king ruling Tibet became a reality 900 years later in the 17th century. The term “Dalai Lama” in its Mongolian roots means a “Teacher whose wisdom is as great as the ocean.” The pre-eminence of any Dalai Lama’s rulership of Tibet was assured by the time of the Fifth Dalai Lama, Lobsang Gyatso (1617-1682). Since then, each heir to the title is regarded as an incarnation of Chenrezi, patron saint of Tibet, who exists only in the spiritual plane as an oversoul. Chenrezi can manifest in the physical plane as one of five sub-soul aspects — these manifestations incarnate in other high lamas of the Tibetan spiritual-political hierarchy, which includes the Panchem and Karmapa Lamas. The coming of the Chinese invasion and cultural as well as physical genocide of the Tibetan people was foreseen long before it happened. Indeed, it is claimed that Tibetan astrologers calculated the very year of the Chinese invasion for “1950” more than a century earlier. Preparations were made to replace and hide real books of scripture and holy relics with decoys, for they foresaw the Chinese would try to wipe out their religion as well as their flesh-and-blood existence. When the iron bird flies and horses run on wheels, the Tibetan people will be scattered like ants across the face of the earth. 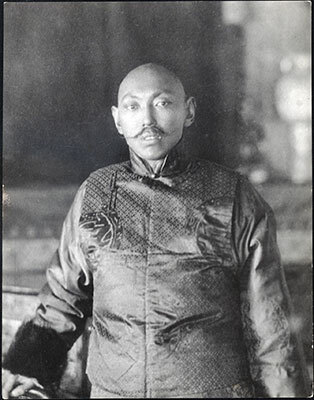 In the early decades of the 20th century, Thubten Gyatso, (also known as “the Great” Thirteenth Dalai Lama), who ruled from 1895 to 1933, recognized the signs of “iron bird” portents in airplanes and the coming of automobiles and trains as the “horses” running on wheels foretelling the Tibetan Apocalypse and Diaspora was near. It may happen that here…in Tibet the religion and the secular administration may be attacked both from the outside and from the inside…. The Dalai and Panchen Lamas…the holders of the faith, and the glorious rebirths, will be broken down and left without a name. As regards the monasteries and the priesthood [the lamas], their lands and other properties will be destroyed… [They] will find their lands seized and they themselves made to serve their enemies, or wander about the country as beggars do. All beings will be sunk in great hardship and in overpowering fear: The days and nights will drag slowly into suffering. The Communist Chinese invaded Tibet 18 years later, and a systematic process of annihilating the Tibetan religion and culture began. By 1959, red guards ransacked and dynamited monasteries and entire monastic cities, casting the lamas out into the cold. Hundreds of thousands of Tibetans starved to death. Thousands of monks were brutally tortured and murdered. A flood of Han Chinese settlers crowded into Tibet. The Tibetans have become strangers in their own country and have declined in numbers. The Chinese defend their harsh invasion saying they ended feudalism and the tyranny of theocracy in Tibet and that the natives are far better off than reports and rumors tell. Yet, when journalists ask to verify this is so, they are categorically denied access by the Chinese government into Tibet. Other reports a half-century-and-counting pass in misery over the icy fastness of Himalayan passes down into Nepal and India. They speak of continued torture, genocide, and violent crackdowns by Chinese military police and unending persecution of Tibetans. It would seem the Han Chinese in the 21st century would be as successful in their genocide of Tibetans as the Caucasian Americans where in their genocide inflicted on Native Americans in the 19th century. There is a Tibetan prophecy that says there will only be 14 Dalai Lamas before the lineage is either extinguished or rendered spiritually or politically irrelevant. Tenzin Gyasto, therefore, could be the last. The Tibetan people will be scattered like ants across the face of the earth. And the Dharma (religion) will pass to the land of the red man (Native American). Those currently dying in genocide will move their spiritual center to the land of those who survived genocide. With every cherished flower there must come death and a seeding for a better flowering to come.